Do sharks hear the Jaws theme music too? MAYBE the reason I’m scared of them is that they’ve got pointy teeth and, potentially, they can kill you or at least rip off a limb or two. Yes.. that’s definitely the reason I’m scared of sharks…. oh, and there’s that foreboding theme tune from Jaws. Even though I know full well I’m way more likely to die from being struck by lightning, crossing the street or even at my own hands, I can’t get those scary pointy teeth out of my head. But that doesn’t mean I’d like to go out and kill sharks. I’d be more likely, to be honest, to wish ill-will of John Williams, the guy that put together the alternating E and F notes to make that horrible theme tune. I can’t really say if I’d feel any differently if I actually were unfortunate enough to be partially eaten by one, but I’d like to think that I would react in the same way as Australian navy diver Paul de Gelder, who “lost” his right hand and lower right leg in Sydney harbour last year. At the time, the local News Ltd tabloid newspaper went on it’s own feeding frenzy and even sent out a journalist to try and catch a shark. 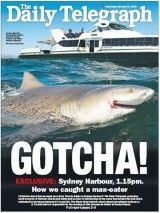 “Gotcha – How we caught a man eater” the newspaper screamed on its front page, before going on to reveal that the shark they “caught” actually got away. Anyway, it appears that de Gelder has a rather different reaction to his situation than the local tabloid press. He has joined with other shark attack victims from around the world for a new campaign to help save the animals that bit them, as reported here in the Sydney Morning Herald and the Huffington Post. Pew Environment Group, a Washington-based organisation that brought the survivors to the UN, says 30 per cent of shark species are threatened or near-threatened with extinction, while the status of 47 per cent is not properly known. Understanding the impact which humans have had on these majestic (but still pointy-toothed) creatures makes you wonder whether it would be more appropriate if the sharks were the ones hearing the foreboding theme song whenever they come across a human, rather than the other way around. INSPIRING stuff from the World Society for the Protection of Animals. Some clever creative spark got the idea of getting people to record one word of a speech via an anti-whaling campaign website and then they spliced them all together. This is what it sounded like by the time they took it to the recent meeting of the IWC. ABC Carbon has just published a list of the 50 people in Australia contributing the most to awareness and action on climate change, conservation and green issues. The list, which excludes journalists and politicians (there’s going to be another list of those types soon), has everything from world famous actresses to local campaigners, business people, scientists and activists, and a few who blur the lines. Ken Hickson, author of the book ABC of Carbon and the excellent ABC Carbon newsletter, asked me to help review and shorten the long list of nominees – a process which made me realise just how many people really are trying to make a positive difference. Boiling this list down a bit further, I’d be picking out the likes of the massive-brained author Clive Hamilton, the courageous climate activist Anna Keenan and Professor Will Steffen, the science advisor to the Department of Climate Change and Energy Efficiency. I’ve just finished reading Clive’s book Requiem For A Species which examines why civilisation has failed to act on climate change and how, not to put too fine a point on it, we should all forget the notion of being able to “beat” climate change. You can buy a copy of Clive’s book all over the place, but in a plug for a local company you can also order it from Sustainable Insight. Anna Keenan is a young women for whom I have the utmost admiration. No commitment issues for Anna, who managed a 40-day hunger strike in the run up to, and during, the ill-fated Copenhagen climate change conference. Here’s a blog she wrote for me in the middle of that ordeal. A few weeks ago, Professor Will Steffen was brave enough to say publicly what most other climate scientists must surely be saying privately all the time when he described the manufactured debate over climate change to be “infantile”. Here’s a great profile of the Professor here, on The Age. And now to the second bit of the headline for this blog (look up there), the bit about old men, because they came up in a seminar I attended last night hosted by Professor Steffen. His main 45-minute speech covered the importance of a multi-disciplinary approach to research on climate change adaptation, but it was an off-the-cuff remark made during questions which prompted the biggest round of applause of the evening. He was talking about the general need for everyone in Australia to be innovative in finding ways to adapt to climate change. And why isn’t this happening now? There’s a blockage caused by old men who largely block innovation. So there you go. We can now add “old men” to the list of climate change foes which includes fossil fuels, money, consumerism and political cowardice. IN recent days I’ve been talking to several anti-whaling campaigners and an international professor of law but none of them saw this one coming. The headline on the joint statement from Australian ministers Stephen Smith (Foreign Affairs), Peter Garrett (Environmental Protection and Definitely-Nothing-To-Do-With-Insulation) and Attorney-General Robert McClelland sort of gives the story away really. The statement comes as delegates arrive in Agadir for the annual meeting of the International Whaling Commission where all eyes will be on agenda item 3 – a so-called compromise deal to bring the three whaling nations of Iceland, Norway and Japan into line. At the end of April, in a speech to the Australian National University, Peter Garrett outlined Australia’s dislike of the new proposal and did warn we would pursue legal action if the Government’s demands were not met. Perhaps that’s why this announcement will have caught most people on the hop. There has been much written about that compromise deal already. The BBC has a good summary here, but in short it would allow whaling by non-indigenous hunters from those nations still killing the animals – Japan, Iceland and Norway. It would also set up an international team of observers and set quotas (campaigners say more than half of the species included in the draft proposal have not had a scientific assessment conducted on the health of their populations). There’s been a moratorium on commercial whaling since the 1985/86 hunting season, but it didn’t stop nations from killing the animals. Norway and Iceland get around the moratorium by just objecting to it (if only parking fines worked that way). Japan also tried this tactic, but these days uses a condition from the original 1946 convention that allows whaling in the name of science, known as Article VIII. We can see today’s announcement as a statement of intent by Australia – a bit of diplomatic positioning – that if it doesn’t get it’s own way in Agadir, it’ll be heading for The Hague. By the way, I took the pic of the whale myself during a whale watching trip off the coast just north of Brisbane. They look better alive than dead. UPDATE: Here’s why I was talking to the campaigners an law experts. Feature on ABC Environment. IF you’ve not seen it in the wild then you’ve probably seen it on telly – lizards sat out in the daylight, sunning themselves when there’s surely some housework to be done. So to the ignorant or uninformed (I’m one of them), you’d think that warmer global temperatures would just mean more fun in the sun for the world’s lizard populations. Not so, according to a new study in Science. Even though lizards do love to warm up in the sunshine before going off to find food, they all have a point at which they’ve had enough. Higher temperatures can force them to run for cover, which the international team of researchers explain cuts down the time they can spend foraging for food. 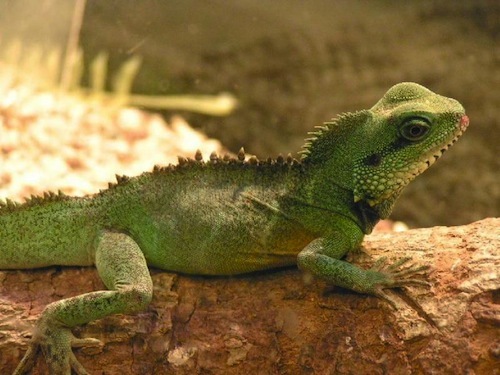 The researchers first looked at this physiology in the lizard and then developed a model taking into account rising temperatures across the globe. They then used the model to see if it matched observed extinctions in 2009, which in Australia look like this first map. The model replicated their observations of extinction rates on five continents. Next, they used the model to see what will happen if emissions of greenhouse gases and, in correlation, global temperatures, both keep rising. Then, the extinction rates for lizard populations looks like this. First for 2050…. … and then for 2080. On a global scale, by the year 2050 the probability of any species becoming extinct was 6 per cent and by 2080, it was 20 per cent, the study concluded. We did a lot of work on the ground to validate the model and show that the extinctions are the result of climate change. None of these are due to habitat loss. These sites are not disturbed in any way, and most of them are in national parks or other protected areas. The loss of lizards isn’t just bad for, well, lizards, but researchers said it would also have an impact up and down the food chain. Lizards represent food for other animals as well as keeping the insect population in check. Sales of lizard sunscreens and shade umbrellas (also used in cocktails), could receive a boost, no one said. I’M not really looking forward to seeing the “new” documentary movie End of the Line (first premiered in January 2009) when it opens in Australia on Friday, but see it I will. Based on a book of the same name by British journalist Charles Clover, the film looks at… ahh, just watch the trailer and see for yourself. For screenings, go here.